Deep in the suburbs of Perth, Western Australia, lies a bush reserve called Bibra Lake. This falls under the local council umbrella named City of Cockburn. Thanks to these wonderful bunch of caring people, Bob the Barn Owl, has found a new home. As you may know Bob needs a very large and old tree to live in. Unfortunately, due to land clearing, there are very few around. He loves this countryside, with large areas of small grass near the lake to hunt. He has no shortage of food because there are mice running all over the place. But, just like all the other critters of this beautiful land, he’s always looking for a place to call home and raise his children. Well, one night, while gliding and floating around through the trees he saw an odd shaped tree with a large hole poking out. Getting excited he swooped in, landed on the large knotty branch and peered in. Now his heart was pounding…’this is beautiful’ he thought. The entrance was large enough for him to fit through and the “hollow” was deep. Well, not as deep as he would really like …but it’s good enough. After climbing down he reached the bottom. Hmm, looking around inside he decided this was going to be his new home. 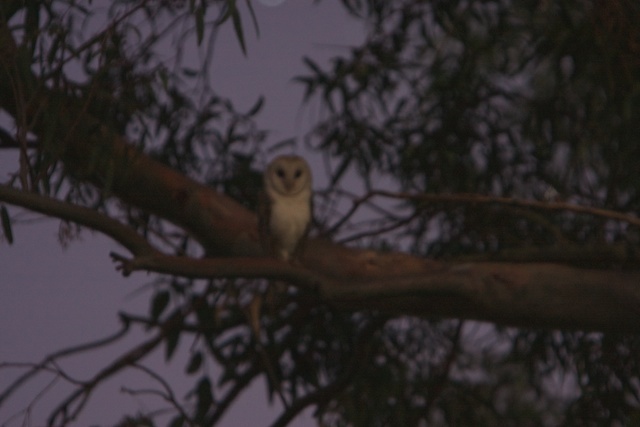 Throughly excited by now, he couldn’t wait to tell Mrs Owl. Up he climbed(didn’t quite feel like wood) till he reached the top, and with one last look, turned and leapt off flapping his wings, eager to share his wonderful find. That’s great news Joe – the owls have approved your great design! Thanks Denise, Now Bob’s out flying around his new address with his family. The young ones are constantly screeching. I think it’s a ‘want,want,want” type of call. Good work Joe. 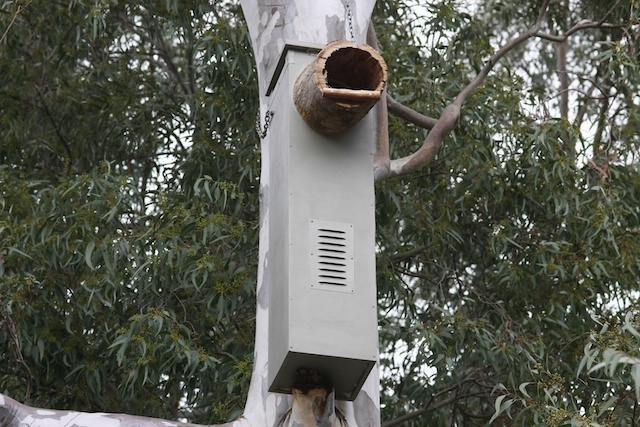 Impressive looking nest box. Main thing is, Bob thought it was pretty good too. Thanks John, I’m lucky to have the skills to help the animals, particularly the owls.